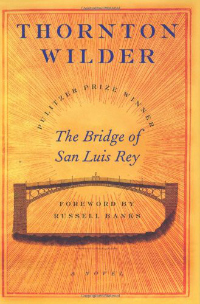 The Bridge of San Luis Rey is a blazingly smart and utterly absorbing little book; I only put it down once. Reading it is like descending an ornate spiral staircase, alongside which runs a wall filled with alcoves containing tiny, curious treasures. These artifacts call to you, so you pick them up and turn them over in your hands for a moment - but the lure of what lays at the bottom of the stairs is too great, so you keep going down, down, down. And when you reach the cellar you find yourself in a place that's at once totally strange but somehow comforting. You don't want to leave. You know you could learn a lot here. "He possessed the six attributes of the adventurer--a memory for names and faces, with the aptitude for altering his own; the gift of tongues; inexhaustible invention; secrecy; the talent for falling into conversation with strangers; and that freedom from conscience that springs from a contempt for the dozing rich he preyed upon." "He regarded love as a sort of cruel malady through which the elect are required to pass in their late youth and from which they emerge, pale and wrung, but ready for the business of living." "Like all solitary persons he had invested friendship with a divine glamour; he imagined that the people he passed on the street, laughing together and embracing when they parted, the people who dined together with so many smiles--you will scarcely believe me, but he imagined that they were extracting from all that congeniality great store of satisfaction."